At this time of year pumpkins are all the rage whether it’s in food or for decorating. Some can’t wait to get that first Pumpkin Spice Latte’ from Starbucks. Ok – full disclosure here – pumpkin isn’t one of my favorite flavors, but I do love pumpkin pie. I wanted more of a dessert to feature pumpkin, instead of just pumpkin pie so I thought of mousse. This is almost the same taste of a pie but without the crust, which I don’t usually eat anyway. A win-win in my book. Then, by adding chocolate and candied pecans, it just kept getting better.As you know, anything I can make ahead of time is a good thing when preparing for a dinner party, potluck, and especially Thanksgiving Dinner. Plus serving is easier when you have individual desserts. When entertaining, presentation is everything. You first eat with your eyes so if it more appealing visually, you know it will probably taste better too. Martini glasses are great for any pudding or custard desserts. Don’t have martini glasses? I didn’t either so off to one of my favorite stores – Dollar Tree. Martini and wine glasses are just a few of the types of stemware you can find there. Another great point of only paying $1 for a glass, it’s easily replaced if broken. Spoon mixture into individual ramekins or glasses. Melt Candy Melts in the microwave, using a microwave safe bowl. Heat for 30 seconds at a time, stirring after each time, until fully melted. Stirring well also helps to get all pieces melted. After one minute, heat for only 15 seconds each time. Be careful not to overheat these. These should just be melted but not hot to the touch. Spoon half of mixture into a piping bag with small tip. If you don’t have a piping bag, a quart size zipper freezer bag works well too. A freezer bag is a heavier weight than just a sandwich bag and works better. Snip a SMALL bit of one corner off. Swirl chocolate inside each glass making your own design, or just a random pattern. Set these glasses aside to let the chocolate harden, which only takes about 5 minutes. 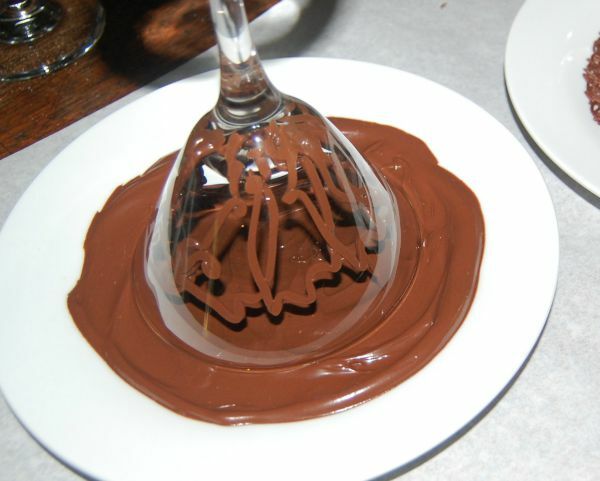 For chocolate rims, spread the remaining chocolate onto a small plate. The chocolate will harden quickly on cool surfaces so if you have your plate warmed ahead of time it will help. You can do this by just running under hot water and drying well. Water and melted chocolate doesn’t mix well. 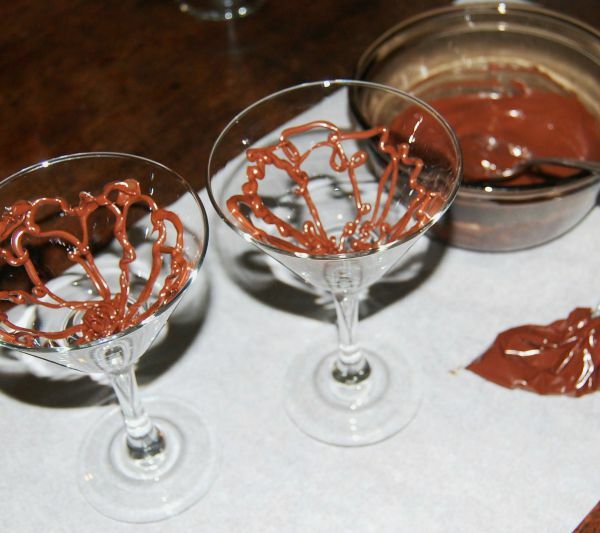 Invert your glass into the chocolate and twist a couple of times to make sure your edges are covered. 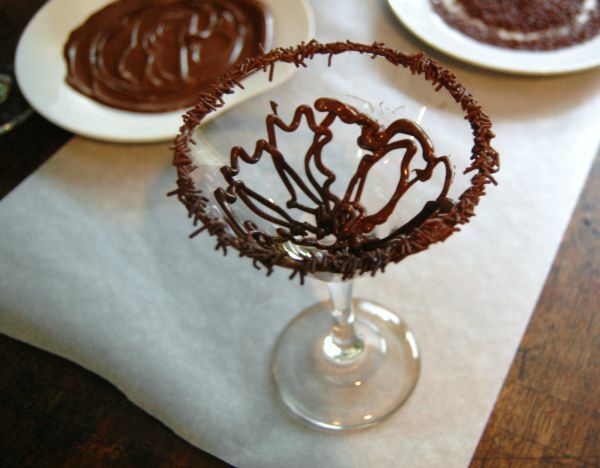 Immediately dip into your chocolate sprinkles. If your chocolate begins to harden, place the plate into the microwave for 5-10 seconds at a time. Mix together sugar, cinnamon and salt in medium mixing bowl. Whisk egg white just until frothy in a small mixing bowl. Add pecan halves to egg whites and stir until all are coated. Using a slotted spoon, move your coated pecans into the sugar mixture. Mix pecans in the sugar mixture until all are evenly coated. Spread onto a baking sheet covered with parchment paper and bake for 1 hour, stirring every 15 minutes. Transfer hot pecans to another baking sheet for cooling. Candied pecans can be made ahead of time and stored in air tight container. These are also great for parties or to give as gifts. Don’t you love how you can see the chocolate through the glass? Oh, and think about when you are piping it into the glass, make an extra little dollop in the bottom. Nothing finishes off dessert like a bite of chocolate. Hope you will consider kicking up your fall dessert menu up a notch with this. Make sure you visit all of the sites listed to get fall inspired. This is actually a mousse. I have got to get through everyone on the Harvest Tour of Homes. Hope you try. 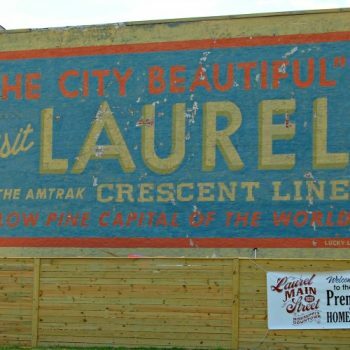 Stopping by from the Harvest Home Tour. That pumpkin mousse looks divine and the presentation is beautiful! Can’t wait to get through everyone on the Harvest Tour of Homes. Hope you try. I’m visiting as a fellow participant of the Harvest Tour of Homes. This mousse sounds delicious and looks amazing!! I have got to get through everyone on the Harvest Tour of Homes. Hope you try. Stopping by for a little dessert after the Harvest Homes Tour! 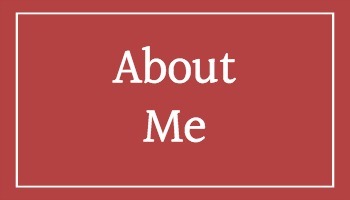 I’d love to feature your post on my FB page next week. Is that ok? Thanks for offering to feature my recipe. That would be great. I’ve got to get by to check out everyone else. Oh my! I can’t wait to try this recipe….. It would be the perfect ending of a fall meal…. YUMM-O! Thanks so much for sharing on the Harvest Tour… You are awesome! Hope this was what you was looking for. Thanks for including me. This looks amazing and I can’t wait to try this out. Yummy! Stopping by from he Harvest Home tour. Gotta get on the Harvest Home Tour and share some. Hope you try. Oh man, that sounds amazing. It’s so pretty too, with the chocolate drizzle. I’m going to have to try this. I’m stopping over from the harvest tour. I’m still working on harvest tour. It was good and really easy. Hope you try. It looks very elegant and certainly so delicious! What a beautiful dessert! 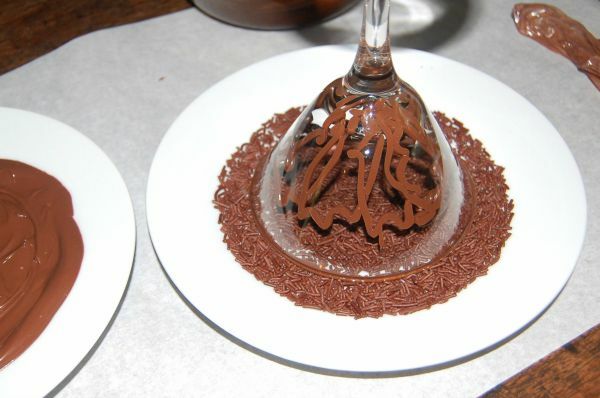 I love how you have decorated the pretty glasses with the chocolate. It looks so elegant – and very delicious too! I love making a great presentation sometimes but others it might just be a bowl of mousse. Hope you follow along. Oh my goodness how delicious does this sound, I would never have thought of making mousse using pumpkin I bet it is so unique. That looks really delicious and festive. It would be a perfect Thanksgiving dessert. What a stunning dessert. I’ve never tried pumpkin mousse and after seeing this, I feel like I am missing out. I love the chocolate piping in the glass. It really gives it an elegant feel. It’s easy to add something like the chocolate just to elevate the presentation. These are SO CUTE! 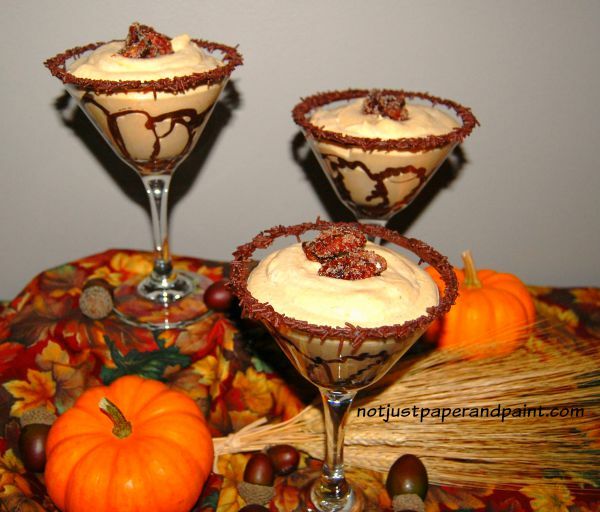 Pumpkin mousse is fantastic and I just love the idea of serving it in martini glasses – perfect for a Halloween party! This time of year is definitely all pumpkin everything and this sounds like a great addition to my recipe box. I love the light airiness of mousse and imagine your pumpkin mousse recipe would be a hit with my family and friends. I’m not crazy about everything pumpkin but pie is my favorite so this is good. Make a glass for me because I am coming over! This looks amazing. I love that pumpkin comes out in the fall in that there’s so much you can do with it. This looks great. Oh wow, that sounds like a dreamy mousse. I might have to try this sometime soon to see if I should make it for a fall brunch I’m planning. 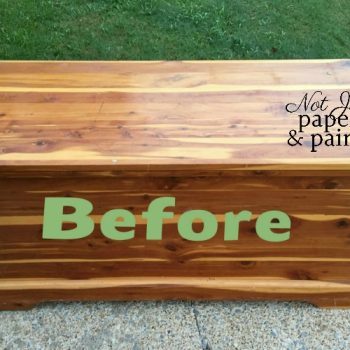 You should try it. And it’s great to make ahead of time too. Oh my gosh this is going to be made even if I am the only one to eat it which I know won’t happen. You are a genius, pure genius. These look amazing. Perfect for holiday hosting. I love festive they look in the glasses too. Yum! 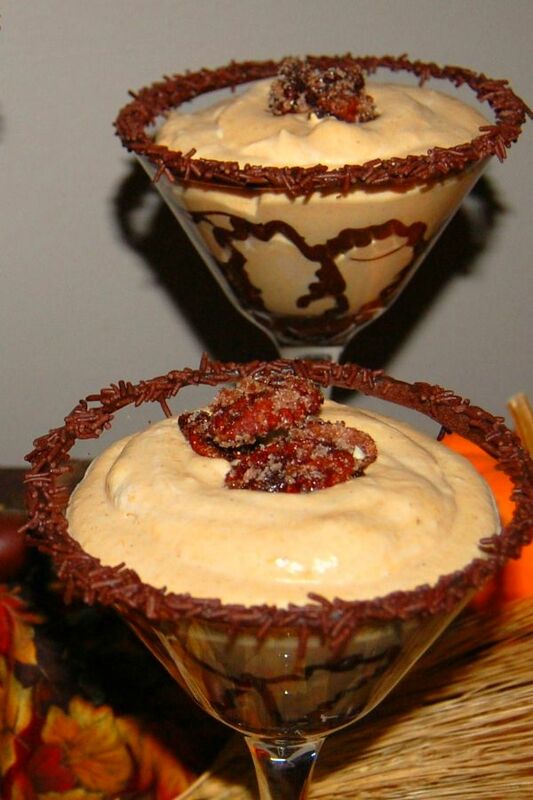 Pumpkin mousse sounds so yummy and decadent and I love the chocolate drizzle in the glass. The candied pecans make a great crust replacement for me. Hope you try it. I love it since it’s so much more than just a piece of pie. What a cool pumpkin treat! I would be happy to prepare these as special Fall treats!Awesome job with the melted chocolate! You know I was just wondering today if the pumpkin flavored everything is overdone. After seeing this, no, it is not! 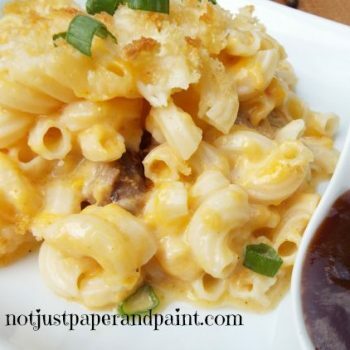 This is one of my favorite recipes I’ve done. Thinking about doing another version as a parfait. Maybe with oreos. Oh wow, this looks so good! I am all about pumpkin anything this time of year but I have never had pumpkin mousse. I am missing out! Thanks for this idea! Oooh, this looks like such a yummy and decadent dessert. I love everything with candied pecans and chocolate! This looks absolutely yummy! Even though I’m not a pumpkin flavor girl normally, I would try this! 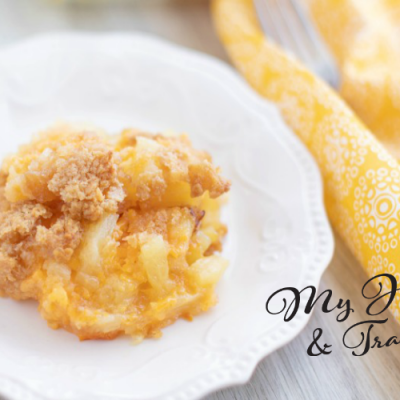 I happen to love pumpkin flavoured anything and these looks delicious! I love the serving tips and ideas as well! Serving desert in a martini glass never gets old! Classy and I’m sure yummy too! I love doing “pretty” food. Watch for a new version soon for this recipe. This sounds and looks delicious. I’d give it a try since I love pumpkins and they are on season. Oh I hope you do try it. And watch soon for a new version of it. I dont know how many pumpkin recipes I have seen these a couple of days but I mush honestly say that your pumkin mousse very delicious! That pumkin mousse looks so silky! Thank you. I’m not a big pumpkin “everything” but a good pie, or this, I love. I have to save this recipe it sounds so delicious. Perfect for this time of year. Oh. My. Gawd. This looks amazing. I told my husband that I want him to make this for Thanksgiving. I love the texture of mousse and its something different! 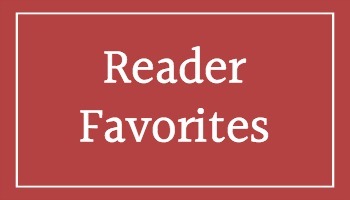 Thanks – I’m working on an updated version which might involve cheesecake and Oreos. Watch for it. I hat the spiced pumpkin latte drink from Starbucks, but would lovee to try this pumpkin mousse! It looks so good! Not a fan of pumpkins or pecans but this looks like the perfect dessert for dinner or when you have friends over. Very creative and elegant. Thanks. This is one of the only ways I like pumpkin. 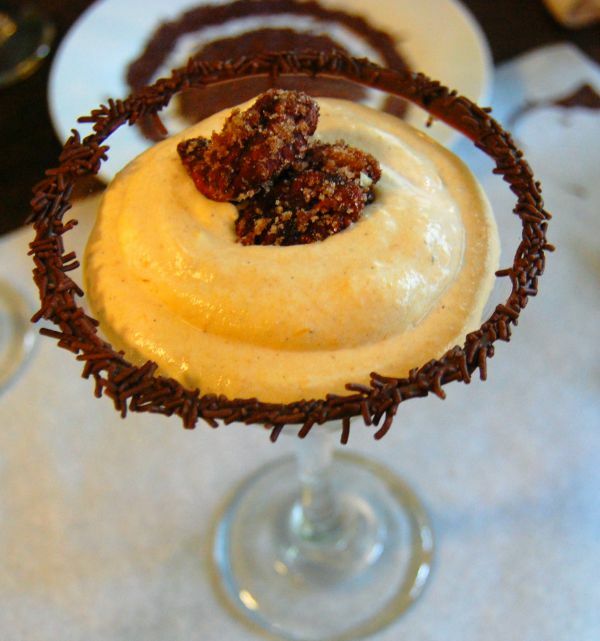 Candied Pecans, chocolate with Pumpkin Mousse sounds perfect. Great for fall parties as well. Thanks for the recipe!